This remastered view of the Jupiter moon Europa is based on information from NASA’s Galileo mission of the 1990s. "NASA has asked us to investigate: What would it take? How much would it cost? Could we put a small surface package on Europa with this mission?" Pappalardo added. NASA has also asked the European Space Agency if it would be interested in contributing a lander, ice-penetrating impactor or other piggyback probe to the roughly $2 billion Europa mission, Spaceflight Now reported in April. Solar system's best bet for alien life? The 1,900-mile-wide (3,100 kilometers) Europa is covered by an ice shell perhaps 50 miles (80 km) thick, but underneath this crust is thought to lie a huge ocean of liquid water 12 miles (20 km) deep or so. So Europa and Enceladus are the top two destinations on many astrobiologists' mission wish lists. Hand gives the Jovian moon a slight edge, though. 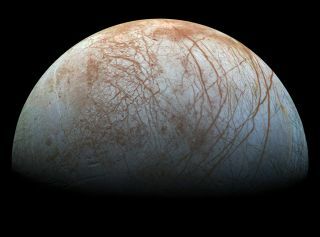 Researchers know enough about Europa to surmise that its ocean has existed since the dawn of the solar system 4.5 billion years ago, giving putative lifeforms plenty of time to evolve, Hand explained. Modeling work about the 310-mile-wide (500 km) Enceladus is less mature, so it's unclear how long the Saturn satellite has harbored its sea. "When it comes to habitability, we'd like to have the knowledge that the potentially habitable environment has been there for a significant duration," Hand said. But enthusiasm about a possible Enceladus mission is high as well, especially because the Saturn moon's powerful geysers offer a way to sample its ocean from afar. Indeed, NASA is considering a potential mission called Enceladus Life Finder (ELF) that would do just that. While ELF remains a concept at this point — it's competing with about two dozen other proposals to become the next mission in NASA's low-cost Discovery Program — the Europa project is officially on the space agency's books. The as-yet-unnamed Europa mission could launch as early as 2022. After reaching Jupiter orbit, the robotic probe will perform 45 flybys of Europa over the course of 2.5 years or so. The flyby mission should also serve a reconnaissance function. NASA has expressed interest in sending a dedicated lander mission to the icy moon — perhaps one that even attempts to get under Europa's ice shell — but doesn't feel ready to do so yet. "We actually don't know what the surface of Europa looks like at the scale of this table, at the scale of a lander — if it's smooth, if it's incredibly rough, if it's full of spikes,"Curt Niebur, Europa program scientist at NASA's Washington headquarters, said during a June news conference that announced the mission's science payload. "Without knowing what the surface even looks like, it's difficult to design a lander that could survive." But that lack of knowledge is less of a concern when the lander under consideration is a low-cost add-on to an existing mission, rather than a billion-dollar, stand-alone project. That appears to be NASA's reasoning, anyway. And we should soon know more about the prospects of a lander blasting off with the Europa flyby probe relatively soon. "By the end of this year, we should have an idea of how that's looking," Pappalardo said at the Space 2015 conference.